The owner of Big Ten Web Design was interviewed by KGAN CBS 2’s Gabriela Vidal. 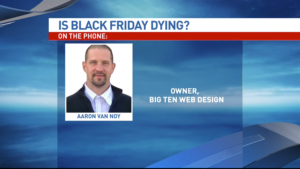 The owner at Big Ten Web Design was contacted by Gabriela Vidal of CBS2 and FOX28 to give his marketing perspective on, “does Black Friday shopping continues to spark interest in the corridor” of Cedar Rapids & Iowa City. He was quoted as saying “Just having the internet at your fingertips, you can get multiple sources of perspectives. Everything from the positives the negatives about the product versus the salesperson. They may not be specifically on top of this one item that you’re trying to really delve l far into before you buy”. The big box stores continue to release their specials even further in advance to drum up attendance and help elevate the demographic that aren’t impulse buyers. As the lines between Black Friday and Cyber Monday continue to blur, this year we saw the introduction of “cyber Monday week”! Brick and mortar stores continue to be affected by online sales, and this and Cyber Monday Week is an attempt to get an even bigger piece of that spending pie.